Riverside Park is a scenic waterfront public park on the Upper West Side of the borough of Manhattan in New York City, operated and maintained by the New York City Department of Parks and Recreation. The park consists of a narrow 4-mile (6.4 km) strip of land between the Hudson River and the gently curving rise-and-fall of Riverside Drive. When the park was first laid out, access to the river was blocked by the right-of-way of the New York Central Railroad West Side Line; later the railroad track was covered over with an esplanade lined with honey-locusts. Riverside Park also contains part of the Manhattan Waterfront Greenway, which encircles Manhattan's waterfronts with car-free bike routes. The 191 acres (0.77 km2) of land which form the original area of the Park (from 72nd to 125th Streets) were undeveloped prior to construction of the Hudson River Railroad, built in 1846 to connect New York City to Albany. The first proposal to convert the riverside precipice into a park was contained in a pamphlet written by William R. Martin, a parks commissioner, in 1865. In 1866, a bill introduced into the Legislature by commissioner Andrew Green was approved, the first segment of park was acquired through condemnation in 1872, and construction began. The conceptual plan for a new park and road was drawn by Frederick Law Olmsted, designer of the nearby Central Park. Subsequently, a series of designers set out to devise the new landscape, incorporating Olmsted's idea of a park with a tree-lined drive curving around the valleys and rock outcroppings and overlooking the river. From 1875 to 1910, architects and horticulturalists such as Calvert Vaux and Samuel Parsons laid out the stretch of park/road between 72nd and 125th Streets according to the English gardening ideal, creating the appearance that the park was an extension of the Hudson River Valley. With the beginning of the City Beautiful movement in the early twentieth century, the border was extended north to 155th Street. F. Stuart Williamson designed the extension with its decorative viaduct, castle-like retaining walls and grand entry ensembles. In 1937, Robert Moses completed the "Westside Improvement Project" to transform the park, which had become a haven for squatters. Moses's project added new landfill west of the tracks, covered the New York Central rail line, and constructed the Henry Hudson Parkway. The park and the parkway were done so skillfully that the public is generally unaware that the Freedom Tunnel, a rail tunnel now used by Amtrak, is underneath. The project, which cost more than $100 million in the 1930s, was twice as big as the Hoover Dam project. The project plan by Gilmore D. Clarke and Clinton Loyd added 132 acres (53 ha) to the park and took recreation into consideration. The park was landmarked as part of the National Register of Historic Places in 1980. In the 1980s Donald Trump, then owner of the 57 acres (230,000 m2) of land just south of Riverside Park that had been the Penn Central freight rail yard, proposed building a massive development including a huge shopping mall and the world's tallest skyscraper. Facing great opposition and hobbled by his weak financial position, Trump agreed in 1990 to adopt a new plan for the site put forward by six civic groups (Municipal Art Society, Natural Resources Defense Council, The Parks Council, Regional Plan Association, Riverside Park Fund, and Westpride). The new plan, called Riverside South, included much smaller buildings and, as the central element, a new Riverside Park South, stretching between 72nd and 59th streets, mirroring the design of Riverside Park further north. In order to expand Riverside Park by 25 acres (100,000 m2), Trump's proposed shopping mall would be removed and the elevated West Side Highway would be relocated eastward to grade and buried. A new Riverside Boulevard would curve above the relocated highway, with the park sloping down toward the river. Portions of the former rail yard, such as the New York Central Railroad 69th Street Transfer Bridge, would be incorporated into the new park. Riverside Park South with and without relocated highway. Riverside Park South Interim Plan. Riverside Park South Final Plan. In November 1998, the Thomas Balsley & Associates-designed first phase of the new Riverside Park South started; Phase 1, a 7 acres (3 ha) section from 72nd to 68th Streets, was opened three years later in April 2001. Pier I at 70th Street, part of the railyard, was rebuilt; it maintains its original length of 795 feet (242 m), but is narrower than originally, at 55 feet (17 m). Phase 2 comprises a waterfront section from 70th Street to 65th Street. Phase 2, opened in June 2003, has two plazas at 66th and 68th Streets, as well as a jagged waterfront. Phase 3, opened in August 2006, stretches from 65th Street to 62nd Street on the waterfront. Phase 4 opened in 2007 along the waterfront from 62nd to 57th Streets. The design of Phases 5, and 6, located between the current and future highway alignments, is partially tied to the fate of the highway relocation, the timing of which is still uncertain. However the Parks Department has approved interim and final designs for those two sections; construction of the interim park will start in 2017. Relocating the highway will require some reconstruction of the park. With the addition of Riverside Park South and Hudson River Park, created between Battery Park and 59th Street as part of the 1990s West Side Highway replacement, a continuous waterfront right-of-way for pedestrians and bicyclists now stretches nearly the length of Manhattan from north to south. The most used sections of Riverside Park are on the tiered slopes between the Hudson and Riverside Drive from 72nd Street to 125th Street. Riverside Park South extends from 72nd to 59th Street on the former Penn Central yard, with an old locomotive on display. Riverside Park South leads to Hudson River Park which goes all the way south to the tip of Manhattan. There is also a northern section of the park from 135th Street to 155th Street and adjacent to Riverbank State Park. Paths along the river connect the park to Hudson River Park to the south and Fort Washington Park to the north. The portion from 181st Street to Dyckman Street, including Inspiration Point, fell into disrepair and disuse in the late 20th century, and was restored at the turn of the century. Before the park existed, Edgar Allan Poe liked to sit on rocky "Mount Tom" at 83rd Street. Amiable Child Monument, at Riverside Drive north of 122nd Street, on the slope north of Grant's Tomb; it commemorates the long-ago death of a beloved child, a small boy who died in what was then an area of country homes near New York City. One side of the monument reads: "Erected to the Memory of an Amiable Child, St. Claire Pollock, Died 15 July 1797 in the Fifth Year of His Age." The monument is composed of a granite urn on a granite pedestal inside a wrought iron fence. The monument, originally erected by George Pollock, who was either the boy's father or his uncle, has been replaced twice due to deterioration. 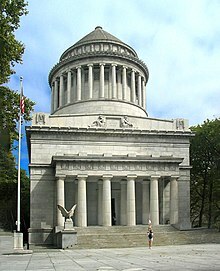 The monument is thought to be the only single-person private grave on city-owned land in New York City. Soldiers' and Sailors' Monument, which commemorates Civil War veterans of both the Union Army and Navy, stands at the west end of 89th Street. "This is the site for the American memorial to the heroes of the Warsaw Ghetto Battle April–May 1943 and to the six million Jews of Europe martyred in the cause of human liberty." Riverside Park contains many physical structures that are not considered monuments. Arched structure at 105th street containing Ellington in the Park concession. Riverside Park contains many playgrounds. Riverside Park contains many playgrounds that are designated as "Tot Lots". Riverside Park contains many dog runs. Riverside Park contains many concessions. Riverside Park's numerous recreation facilities include tennis, volleyball and basketball courts; soccer fields, and a skate park that opened in the summer of 1995 at 108th Street. There is a marina at 79th Street and also a kayak launch at 148th Street; during the spring and the summer, there is also a free kayak rental at the lower tip of the park. Kayaks may be rented only on weekends, weather-permitting. There are also softball/baseball/soccer fields, traveling rings, and a skate park. A bicycle/skating/scootering pathway, part of the Hudson River Greenway, leads from 125th Street to 59th Street. Riverside Park almost received a children's playground designed by the great poets of Modernist style, the architect Louis Kahn, and the sculptor/architect Isamu Noguchi, working in collaboration. Despite their having redesigned the playground five times between 1961 and 1966, however, they were met by much neighborhood resistance, and the project was canceled by the new administration of Mayor John Lindsay. Riverside Park is enjoyed by many people. Youth sports leagues, including the West Side Soccer League, utilize the fields. A free season of events, named Summer on the Hudson, takes place throughout Riverside Park between May and October and hosts dozens of fun events for all including movies, concerts, and children's shows. Riverside Park is supported by a nonprofit partner organization, the Riverside Park Conservancy. In the late 1970s, New York City's park system was in bad shape: underfunded and plagued with crime. Out of this period, Riverside Park Fund emerged as a grassroots community organization formed to reclaim the park by establishing community gardens and improving park maintenance. Today, the Fund's heir Riverside Park Conservancy has over 4,000 members and a budget of nearly $2 million, most of which is dedicated to park programs and projects, like gardens, playgrounds, sports fields, monuments and landscaping. Riverside Park Fund's volunteers dedicate over 35,000 hours of service to the park. As of 2011, a transformation to part of the park began. The project called Green Outlook, under the auspices of Riverside Park Conservancy and NYC Parks and Recreation, involves building a wildflower meadow and carbon-neutral public facility in the place of an abandoned highway exit ramp that currently exists. Construction is still a few years away but the website GO includes a project diagram and details. Visually and operationally organic, the facility will meet the highest green standards and serve as a future model for carbon neutral construction city, state and nationwide. The "Baseball Furies", one of the more memorable street gangs from the film The Warriors (1979), hail from Riverside Park. The park itself featured in two scenes from the film, once where it was meant to be Pelham Bay Park, another as the actual park where the Warriors are being chased by the Furies. The Seinfeld episode "The Frogger" (April 23, 1998) revolved around Jerry's not wanting to go near a girlfriend's apartment near Riverside Park, because of a serial killer named "The Lopper", who killed in the area. The Law & Order: Criminal Intent (season 10) episode 6 "Cadaver" opens with the discovery by a jogger of a dead body propped against a tree in Riverside Park. In 30 Rock, it is the location where Liz and Criss first met. In the Friends episode "The One with All the Rugby", it is the location of the eponymous rugby game, where Ross plays with Emily's friends, Liam and Devon. ^ a b c d e f g Park history, riversideparknyc.org. Retrieved August 26, 2014. ^ Leuck, Thomas J. "NBC Will Not Move to Television City", The New York Times, October 31, 1987. ^ Todd S. Purdum, "Trump Revises Project Plan for West Side", New York Times, March 6, 1991. ^ "The Surprise in This Box? A Highway, Some Assembly Required", New York Times, June 23, 2006. ^ Arthur Hobson Quinn and Shawn Rosenheim, Edgar Allan Poe: A Critical Biography 1997: "a rock overlooking the Hudson, known as "Mount Tom", where he would spend hours gazing at the river." ^ "Amiable Child Monument". Riverside Park Fund. Archived from the original on 19 June 2010. Retrieved 1 February 2010. ^ Wayne Jebian, "The Missing Monument", 1995. ^ Noguchi's unrealized project "1964 Model for The Adele Levy Memorial Playground"
^ Philip Fennell Archived 2008-12-03 at the Wayback Machine "Lost Opportunity", American Heritage, April/May 2007. ^ The season line up can be found here. ^ Greenbuilding in Riverside Park – State of the Planet. Blogs.ei.columbia.edu (2012-04-18). Retrieved on 2013-09-07. New York City Parks and Recreation Dept.